The earliest version of this famous bridge goes back to 1173, when it was a simple pontoon bridge built on a string of boats. The first real bridge came in the 13th century, and it was burned during the insurrection of Baiamonte Tiepolo in 1310. Later incarnations were rickety-looking wooden structures; you can see the last of them in Carpaccio’s paintings in the Accademia, with a narrow wooden drawbridge at the centre to allow the passing of sailing ships – and to cut communications when brawls between the city’s rival factions got out of hand. 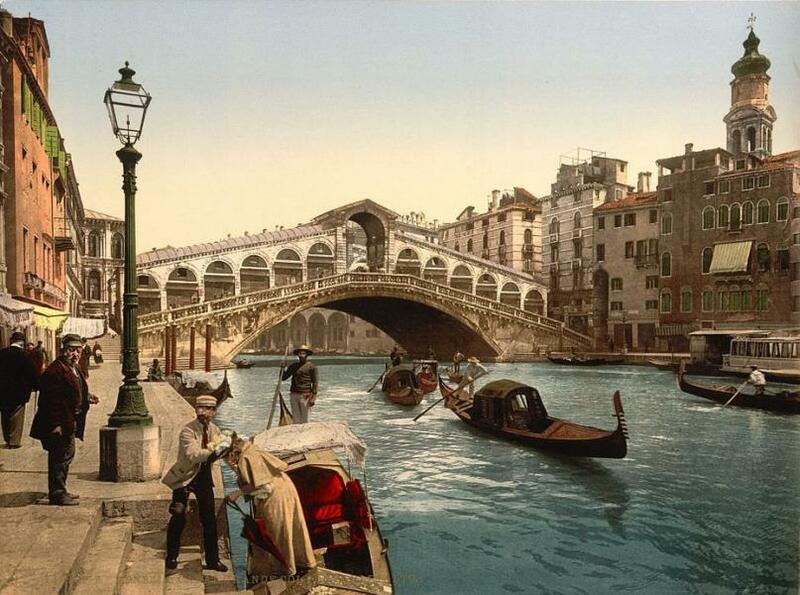 The stone bridge, one of Venice’s eternal symbols, was planned as early as 1524, but not begun until 1588. The state held a competition for the design, a prestigious commission that attracted Sansovino and some of the finest architects of the Renaissance – even Michelangelo submitted a proposal. Classically minded critics have often regretted that Palladio’s design was not chosen; pictures of this survive, a truly ghastly Behemoth covered with Palladian temples and dripping with statues that would have looked as jarringly out-of-place here as a modern glass skyscraper. Instead, the prize went to the suitably named Antonio da Ponte. The state councillors chose well, as they always did in their more grandiose undertakings: their little-known architect engineer gave them the most Venetian of all possible bridges. Avoiding the architectural dogmas of the late Renaissance, he followed the steeply angled silhouette of the earlier bridge, covering it with slanted arcades that conceal rows of shops. The whole manages the difficult trick of harmonizing perfectly with all the buildings along the Grand Canal, Byzantine, Gothic and Renaissance.